A relational database is a computer application that contains two or more tables so that information in one table is made available to another table or other tables that need(s) it. The information is entered once in one particular table. If the same information is needed in another table, it is simply identified one way or another. This reduces, and can eliminate, the likelihood of mistakes that result from duplicate data. To create a relational database, you must have a way for tables to communicate or relate to each other. To start, for a table to make its information available to the other table(s), the table must have a way to be identified. This is done by creating a field used to refer to that table. This field is called a primary key. The primary key can be represented by one field or it can be a combination of fields. The field that is made the primary key would then appear with a key icon to its left. When you click a field that is a primary key, the Primary Key button becomes highlighted . Press Tab and type n.
A primary key makes it possible for a table to make its data available to other tables. If a table A wants to use the data stored in another table B, the first table, A, has to be prepared for it. The first table, A, can be called the child table. The other table can be called the parent table. The child table must have a field that would communicate with the parent table. That field represents the parent table. That field from the child table is called a foreign key. In the same way, any table that wants to use data from a certain table must have a foreign key that can communicate with the primary key of that parent table. To make it easy to identify a foreign key in a table, it is a good idea, not a requirement, to give to the foreign key the same name as that of the primary key. The only real requirement is that both fields use the same data type. The Ceil Inn1 database should still be opened. To establish a relationship that does not yet exist between two tables, you can drag the primary key from the parent table to the foreign key of the desired table. If you drag and drop accurately, the relationship would be acknowledged and you can just click Create to make it formal. If you dropped the primary key on the wrong field, you would have time to select the appropriate fields in the Edit Relationship dialog box. 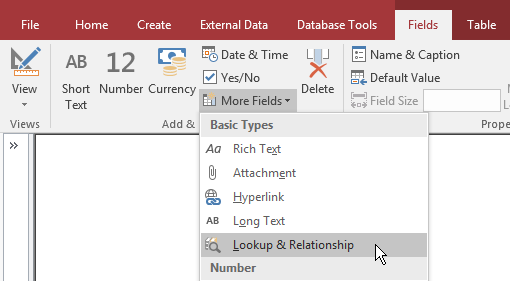 After working with the Relationships window, you can close it by clicking its Close button . You would be asked to save it in order to keep the relationship(s) created. In the Relationships section, click the Relationships button . Now you have a line relating these two tables. There are various ways you can create and manage a relationship between two tables. Once you have a primary key in one table, you can ask Microsoft Access to create and even configure a foreign key for you. You can simply indicate where the data will come from; that is, you must indicate the table that holds the primary key, select the field that holds the actual data to use. For this approach, you use a lookup field. Since you are creating a field that would get its data from another table or query, you must select the first radio button and click Next. Then follow the wizard. When asked to save the table, click Yes. Any of these actions would open the Lookup Wizard. In the Show Table, make sure Customers is selected (otherwise, click it).